December was a difficult month for most hedge funds based on the hedge fund letters we’ve seen so far. Looking more broadly, the hedge fund industry as a whole had some much worse months in 2018. The Eurekahedge Hedge Fund Index was “only” down 1.31%, which beat the MSCI AC World Index’s 7.61% decline during the month. Equity-focused hedge funds were the hardest-hit by far in December as it ended up being the worst month of a bad year for global equities. Equities sold off around the globe due to the Fed’s less-than-dovish commentary, according to Eurekahedge. U.S. stock indices were the worst-hit in December as the S&P 500 tumbled 9.18% while the Dow Jones Industrial Average slumped 8.66%. Those performances were bad enough to make December the worst month for both indices. Eurekahedge also noted that it was the Dow's worst December since the Great Depression. Asian stocks also continued to slump last month even though U.S. President Donald Trump and Chinese President Xi Jinping agreed to delay their next round of tariffs. Brexit continued to weigh on European stocks. Because of the weakness in global equities, long/ short equities hedge funds recorded $18 billion in performance-based losses and $3.5 billion in redemptions in December. Investor redemptions from equity-focused hedge funds reached $18.3 billion for the full year. Unsurprisingly, equity funds were the worst-performing strategy in 2018 with a 6.27% decline. Performance-based losses for the whole hedge fund industry totaled $11.3 billion in December, so other hedge fund strategies partially offset the losses contributed by long/ short equity funds. 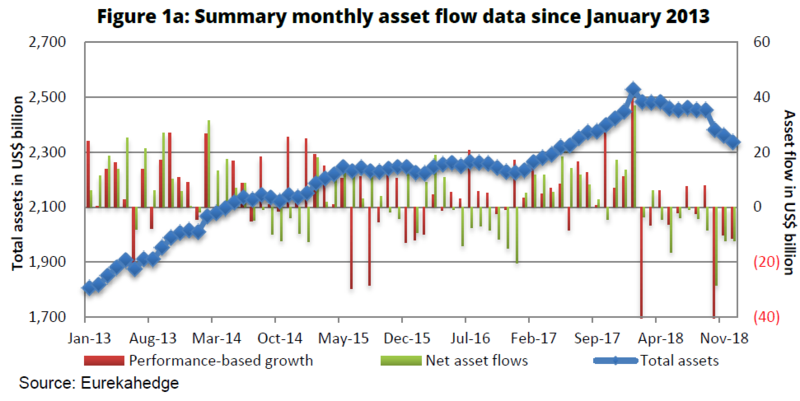 However, the industry as a whole felt the pain of investor redemptions, which amounted to $12.2 billion in outflows last month. Eurekahedge expects December's performance-based losses to widen as January goes on and more data comes in. In fact, the publication expects December's losses to end up being comparable to what was recorded in February and October. As of December, the global hedge fund industry had about $2.226 trillion in assets under management, representing a 4.5% decline in 2018, Eurekahedge reports. The publication adds that 2018 ended up being the worst year for the hedge fund industry since the Global Financial Crisis. In all of 2018, the Eurekahedge Hedge Fund Index was down 3.85%, but it still came out significantly ahead of the MSCI AC World Index, which fell 10.18% during the year. The global hedge fund industry racked up a massive $58.9 billion in performance-based losses and $51.6 billion in investor redemptions. In 2017, hedge funds added $221.9 billion to their assets through performance-driven gains and investor inflows. 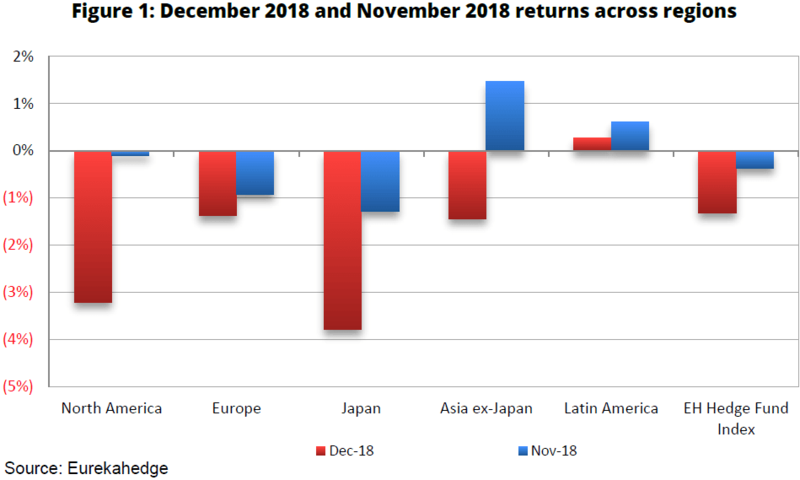 Eurekahedge added that only 38.4% of the hedge fund managers it tracks eked out a positive return in December. Interestingly, about 8.6% of the mangers the publication tracks managed to pull off double-digit returns for 2018 despite the extreme volatility which swept global financial markets. North American hedge fund managers were down 3.21% for December, but Japan funds did even worse than that with a 3.79% decline. However, they did better than the Nikkei 225 and the TOPIX, which were down 10.33% and 10.4%, respectively, in December. North American fund managers were down 2.87% for all of 2018, mostly due to October and December, which wiped out their gains from earlier in the year. Latin American managers were in the green with a 7.66% return on the back of strong equity performance in the region. In December, the only hedge fund strategies that were in the green were arbitrage, CTA/ managed futures and macro. The worst-performing strategy was event-driven, which managed a weaker performance than long/ short equities funds in December with declines of 2.85% and 2.61%, respectively. For all of 2018, distressed debt was by far the best-performing strategy, and arbitrage was the only other hedge fund strategy in the green for the year.